Kik Messenger is a cross OS instant messaging app for mobile devices. It is available on iOS, Android, BlackBerry, Symbian and Windows Phone OS. Kik Messenger is free for all platforms and uses the smartphone’s data plan (or Wi-fi) to send and receive messages. The app is developed by Kik Interactive, a company founded in 2009 by a group of students from the University of Waterloo. A beta version first came out in April 2010, and the first Kik Messenger was released on October 2010. In just 15 days, it reached one million user registrations, and on April 2013, there were a total of 50 million unique users registered. This messenger application allows user to share photos, voice messages, sketches and YouTube content, among others. The company describes it as the fastest and simplest messenger app available on the market. It includes a tracking system in which you can easily see if a message has been send (it appears labeled with an ‘S’), delivered (labeled with a ‘D’) or read (labeled with an ‘R’). 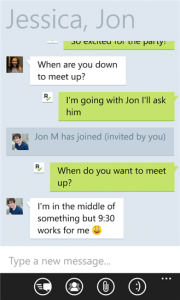 Kik Messenger also has the possibility to do group chats up to 9 people. 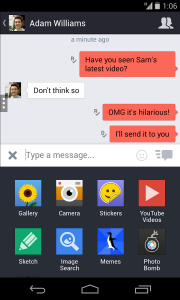 One of the best features of Kik Messenger, in many people’s opinion, it’s the privacy. It requires users to register a username as identification, and it doesn’t link usernames with phones, email accounts or any other personal information. Kik Messeger has more than 80 million users. In general, is similar to Whatsapp, but with the advantage that it is completely free and without ads. One of the main differences between these two messaging apps are the downloadable emoticons that Kik Messenger offers. Some of the most favorite by users are Rage Memes and South Park characters. You can download here the version for iOS, Android, BlackBerry, Symbian and Windows Phone.